This juicer mixer grinder has a 500 Watts Powerful Motor. It comes with Online pulp collector for added convenience. The Overload Protection Function is a safety measure of this device which enhances the life of the motor. It has 3 speed control and Incher Switch for different applications. 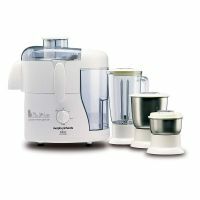 To Recieve updates and possible rewards for Morphy Richards Divo Essentials 2 Jar please sign in. To Recieve updates and possible rewards for Juicer Mixer Grinder (JMG) please sign in.